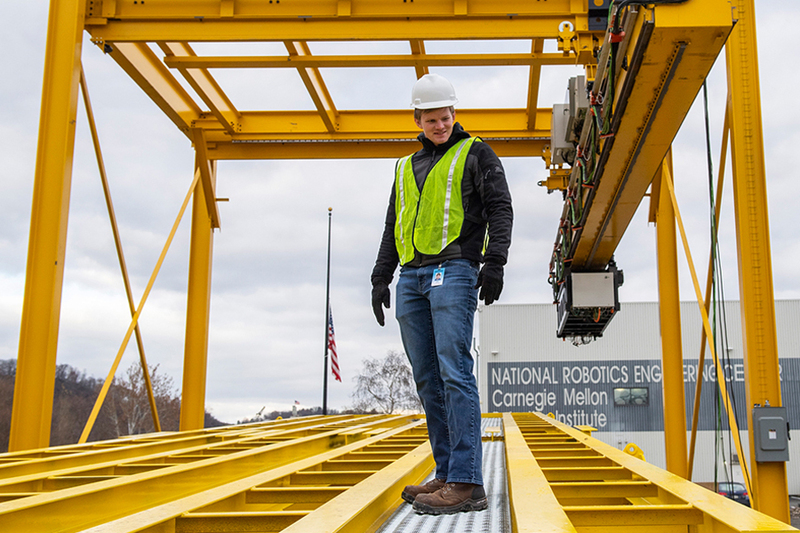 PITTSBURGH—A yellow, steel structure constructed this fall in front of Carnegie Mellon University’s National Robotics Engineering Center (NREC) will be the largest robot ever constructed in the 22-year history of the organization. As big as it is, the prototype robot being built on NREC’s front lawn will serve only to test and further develop systems that will become part of the final, much larger robot – a floating factory called ARMOR1 – that eventually will be deployed on barges on the Mississippi. Mat sinking takes place during the low-water months of August through December and is very labor intensive. Four gantry cranes are used to move concrete blocks from supply barges to a work barge where workers wire the mat together using pneumatic tools. As the mat is being assembled, the work barge inches away from shore to launch the mat along the sloping river banks. The Mat Sinking Unit, which has been in operation for 70 years, is crucial in preventing erosion to the riverbank of the Mississippi River, a vital commercial waterway that drains 41 percent of the nation’s water and is the lifeblood of the U.S. economy. The goal of the automated system is to increase the amount of mat that can be assembled and launched each day while improving worker safety and reducing operating costs. The new system will add technically skilled jobs such as robotic control operators to the ARMOR 1 workforce. NREC is a subcontractor to SIA Solutions and is working with Bristol Harbor Group on the ARMOR 1 project. NREC is responsible for designing the robotic system to automate the entire mat assembly and launching process. Dr. Herman Herman, NREC director, is the principal investigator and Jim Arthur is the project manager.